Victoria grabs a bite. The salmon, sadly, don't. The clouds have cleared and it appears that we have something of a summer on our hands: a good thing for the spirits of Blighty-dwellers, lousy for our two days of fishing on the beautiful River Tamar over the weekend. 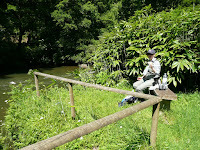 Whilst the water was spot on - right height, with a tinge of colour to it - the fish were put off by the full-beam sunshine. Poor creatures. Not having either eyelids or access to a decent optician where they could equip themselves with some of Bausch and Lomb's finest, they avoid rising up to the fly through the water column. It would probably give them a headache. I am happy to say that Victoria still fits into her waders, despite the fact that she's 6 months pregnant. Up-sides to Victoria's condition: I have a designated driver for several more months to come; bottles of wine go further. Downsides: the designated driving will need paying back; I have to pick up anything that gets dropped on the floor. On a more serious note, if the new one's anything like as fabulous as Joseph, we'll be a pair of lucky so-and-sos. With the onset of some good weather, the thoughts (especially in the garden, c. 12h30 on a Saturday) turn to a glass of rosé. Now, I know that rosé has long been seen in certain circles as the naffest of the naff and barely one step up from Campari (to which I also freely admit to having a liking), but those circles should have a rethink. If the quality's in place, why dismiss a wine simply because it's unashamedly delicious? I still have clients contacting me rather sheepishly and asking whether we stock the stuff, often prefixing their request with such words as "you might want to shoot me for asking, but...", as if there's something terribly infra dig about the consumption of pink wine. I say here and now: It's OK to like rosé! We've requested many samples from an assortment of suppliers. We have undergone some stressful tasting and assessment (by no means all rosé's enjoyable when exposed to the soft tissue of one's mouth). And now we've arrived at a situation in which we find ourslves with 3 fascinating and completely different examples of this much maligned genre. We will be advertising them soon. We have decided that we're going to offer mixed cases of them. Watch and wait! We've been tasting through some wines that we offered in the very early days of Bowes Wine. We bought stocks of these wines ourselves, so enamoured with them were we. I will produce full tasting notes in due course, but I will say that the 1999 Boreas, a Côteaux du Languedoc from an outfit called Abbots, is absolutely superb and right at the top of its game. If you have any, flex that corkscrew arm and enjoy! Finally: we are shifting our thinking somewhat in the light of this squib of a Bordeaux campaign. The thing is gradually hauling its carcass towards the finish line, for which we are very grateful and we've been pondering on what we can do thereafter to restore everyone's humour and convince people that the world is, in fact, filled with exceptionally fine wine. What we have decided is that we're going to launch a regular series of one- or two-wine offers in which we will promote exceptional examples of current or recent top vintages. Already in the pipeline are an exemplary and very exciting Barolo from the great, classic 2004 vintage and a Grand Cru red burgundy of exceptional value of the equally great and similarly classic 2005 harvest. This will be merely the tip of the iceberg. Quantities are likely to be fairly limited, so if you see anything that tempts you, strike like a rattler on Red Bull.